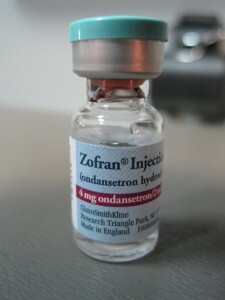 As questions are raised over the connection, if any, between use of anti-nausea drug Zofran (ondansetron) by pregnant women and an increased risk of birth defects, new research indicates that the medication does in fact cross the placenta to reach the developing fetus and likely remains with the newborn for a period of time following his or her birth. The study comes on the heels of prior research which reached similar conclusions and yielded calls for further investigation of the drug’s impact when used to combat severe morning sickness in expectant mothers. The findings of a team of scientists from the University of Colorado, Stanford University and London’s Royal Free Hospital were recently published in the journal Clinical Pharmacology & Therapeutics. The researchers evaluated umbilical cord blood and blood taken from newborns whose mothers had used the drug during pregnancy. Rapid transfer across the placenta was found to have occurred, as was the presence of an extended elimination half-life in the infants as compared with that experienced by their mothers. The journal Clinical Pharmacokinetics previously published a study authored by a research team from Hong Kong which evaluated blood samples taken from 41 women who were given Zofran prior to surgical pregnancy termination procedures. In the end, it was found that Zofran remained in all of the samples reviewed and that concentrations of the drug within fetal tissues were substantially greater than anticipated. Research based on an exhaustive analysis of data taken from the Danish Medical Birth Registry from the years 1997-2010, encompassing 900,000 unique birth events, found that the risk of heart defects in infants born to mothers who took Zofran had doubled. The risk of birth defects overall grew by 30% when compared to those whose mothers were not given the drug. According to the study, 4.7% of pregnant women who used Zofran to treat morning sickness ultimately gave birth to babies with defects, whereas just 3.5% of moms who did not take Zofran had children with defects. Zofran lawsuits are alleging that GSK concealed research data, failed to warn the public about known dangers posed by the drug when used by expectant mothers, and negligently marketed the medication for an application that had never received FDA approval. GSK maintains that the drug is safe, and denies any wrongdoing in regard to the manufacture, marketing or promotion of Zofran. Whether a causal connection can be made between Zofran and birth defects remains to be seen, but drug injury lawyers across the country are currently investigating prospective claims of those who may be entitled to financial compensation.